2operate recently became a member of CANTO, the regional telecoms association of the Caribbean. In early August, Christian Ingerslev Sørensen, CEO of 2operate, together with Lars Moltsen, founder and Chief Science Officer, attended the CANTO 2016 conference in beautiful San Juan, Puerto Rico. The topic was Inspiring ICT Innovations: Building an Entrepreneurial Ecosystem through Sustainable Strategic Partnerships. Lars Moltsen made a speech under the “Global Telecoms Trends” track, explaining how 2operate enables network operators to get access to technical knowledge about network operations from all over the world. 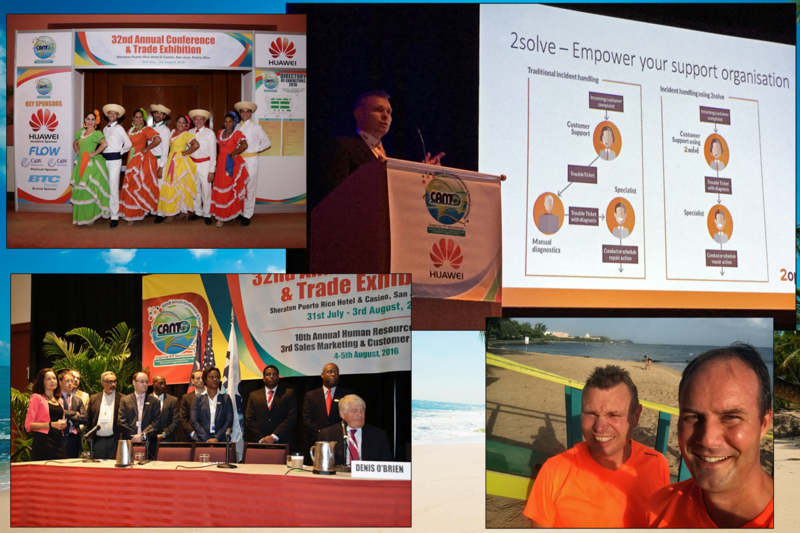 In front of 700 attendees from 30 Caribbean and regional operators, the Chief Science Officer presented the company’s solution – 2solve, the OSS with a brain. Read more about CANTO 2016 at this link. “It has been a very satisfying and successful year for 2operate”, says Christian Ingerslev Sørensen, 2operate’s CEO, “We are working closer to our customers in Scandinavia and the Baltics while we develop our product. With a global perspective, we expect to conquer territories outside of Europe already this year”. Aalborg, August 30, 2016 – After a general board meeting on the 23 August 2016, 2operate gladly announced a profit of DKK 2 million in the fiscal period of 2015/2016 which is the highest result so far. The company is going through a very positive period alongside establishing a new and stronger organization ready to grow globally. 2operate was established 7 years ago and it is currently experiencing a sustainable development. As a company which provides software for network troubleshooting to mobile operators, 2operate has established its competitiveness and competences in a niche market such as the OSS. The company’s financial report points out a surplus of DKK 2 million during 2015/2016 compared to DKK 347.000 from the last fiscal year. The gross profit is estimated to be DKK 4.6 million generated mainly by the current customers located in the northern part of Europe. At Mobile World Congress (MWC) 2016 in Barcelona, 2operate presented version 3.0 of its main product 2solve. This version exploits Big Data technology in order to achieve better responding time suitable for bigger and more complex networks. Few months later, in August, version 3.1 is to be released which includes a number of new clever features. During the previous year, 2operate has also been working in a close cooperation with the European Space Agency (ESA) on a leading project dedicated to discovering the opportunities of using satellite networks for Internet-of-things (IoT). This is the third project which certainly will open new doors for the company. Moreover, since the beginning of 2016, the company has a new CEO, namely Christian Ingerslev Sørensen while the previous CEO and Founder Lars Moltsen became a Chief Science Officer. With solid experience in the telecom and IT, MBA and engineering degrees, Christian’s focus is on strategic and organizational improvements of 2operate.